Vancouver band opening for Simple Plan has a nonstop creative engine in Josh Ramsay. Marianas Trench: Josh Ramsay, right, keeps busy. Look up the word “ambitious” in the dictionary, and you might just see Josh Ramsay’s picture staring up at you. There seems to be no shortage of drive in the young Vancouverite, whether it concerns his eclectic pop band Marianas Trench, one of three acts (including All Time Low and These Kids Wear Crowns) opening for Simple Plan at the Air Canada Centre Sunday, or his numerous writing and production duties for various 604 Records label mates like pop siren Carly Rae Jepsen (signed in the U.S. the other day to Justin Bieber manager Scooter Braun’s new label), country singer Melissa Rae Barrie or punk pop rockers Faber Drive. Case in point is Marianas Trench’s third and latest epic, Ever After. Ramsay, who serves as the band’s chief songwriter, front man and guitarist, fashioned a 12-song, 54-minute fairytale that taps into influences ranging from Beach Boy-flavoured harmonies and rhapsodic Queen-like orchestration to electrobeat grooves employed by any number of modern-day dance pop acts. But he says extending himself is the only way he learns. Ramsay say the current tour is also pushing Marianas Trench — which includes a lineup of guitarist and pianist Matt Webb, bass player Mike Ayley and drummer Ian Casselman — even further as performers. Ramsay admits that due to his band’s support role, the Simple Plan tour isn’t conducive to playing the latest effort, up for a Juno Award for Pop Album of the Year, as it should be heard. “There are no stops on the album — it’s one continuous piece of music with interludes between every song,” he clarifies. “So when we do it live on this tour, we’re not doing it back to front, but we are doing it in pieces so people get to see parts of the story. 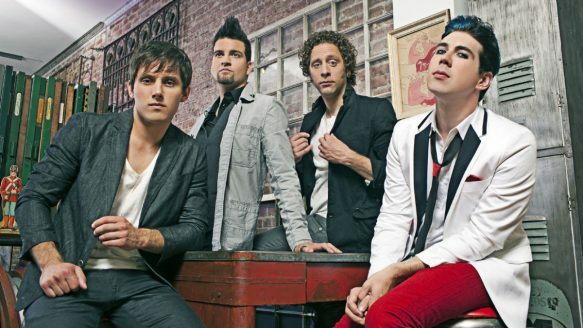 Ramsay expects Marianas Trench to launch a fuller spectacle later this year. Be the first to comment on "Marianas Trench grows ever broader"